Win a Hill Performance Series Concert Guitar in the Omni Concerts 2013-14 Raffle! The Omni Foundation for the Performing Arts is entering its 33rd year of bringing the world’s finest acoustic guitarists to the San Francisco Bay Area. 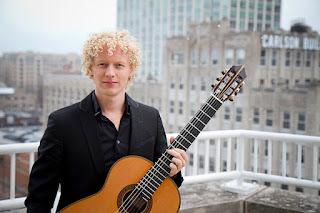 Although the series presents acoustic guitarists of all genres, such as flamenco, jazz and fingerstyle, the primary focus is on the classical guitar. The series is the longest running and most extensive guitar series in the United States and is considered to be one of the foremost guitar series in the world. Omni presents not only the most celebrated virtuoso of our time but also the emerging artists and stars of tomorrow. The concerts take place in San Francisco’s most prestigious concert venues, both intimate and grand and great efforts are made to insure accessibility to the entire Bay Area community, particularly students. 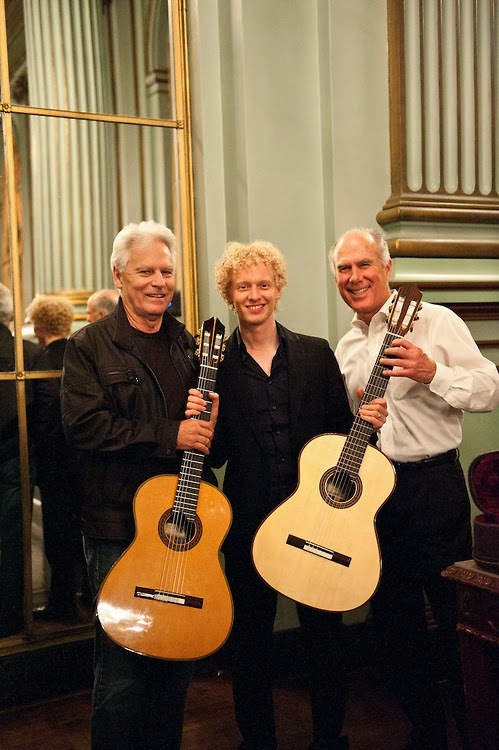 The Omni Foundation, under the artistic direction of its founder, Richard Patterson, continues to provide a significant position for the classical guitar in the vibrant cultural scene of San Francisco. With the support of serious guitar enthusiasts and the City of San Francisco, Omni presents over 20 exceptional guitarists each season. We hope you will join us and experience the brilliance, beauty and potential of this exquisite instrument, the guitar. Win a Hill Performance Series Concert Guitar with Arched Case in the 2013-14 raffle! Drawing held at the Goryachev/Mouffe concert, April 25, 2014. The Performance Series is the newest line of fine guitars designed and built in the Hill California workshop. These guitars offer a great sounding high-quality modern concert instrument at a medium price - List $5500 w case. The Performance Series is handmade in the traditional Spanish style, with the integral body and neck joint, and incorporates a modern double top soundboard, with lattice or fan-bracing. Sound ports are standard, unless requested otherwise. This guitar will be showcased at each concert where you can enter your name into the raffle for only $20! "The video is of my composition "The Night Flame" that is based on raga Kirwani. The film is from a performance at BlueFrog, Bombay on the 15th of September this year." Kenny comments, "I don't know what I could add that wouldn't take away from it! Great song, great performance, great player." Watch The Night Flame by Johannes Möller. Hill Guitar recently received a wonderful letter from Martha Stuart and her new Hill Torres that she named Angel. Read her letter to find out why! Just wanted to thank you so very much for creating such a beautiful guitar. 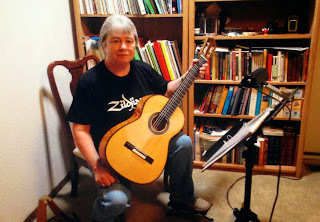 I am just getting back to playing classical guitar after many years. While searching online for a guitar, I came upon Savage classical guitar. I Found the Hill Torres F5 3412 and fell in love with it. I have owned some fantastic guitars in the past, but, when I saw the Torres, I knew it had to be mine. It arrived the next day. I opened the case and there was the most gorgeous guitar I have ever seen. A work of art! The quilted maple back and sides, for some reason, reminded me of angel wings and the voice of the instrument is incredible. And so I named her ANGEL. Thanks so much, and I will tell Angel you said Hello. Kenny and the gang at Hill Guitar Company are delighted to know that their guitars are in happy hands! Guitar Award Winner Diane Konyk! 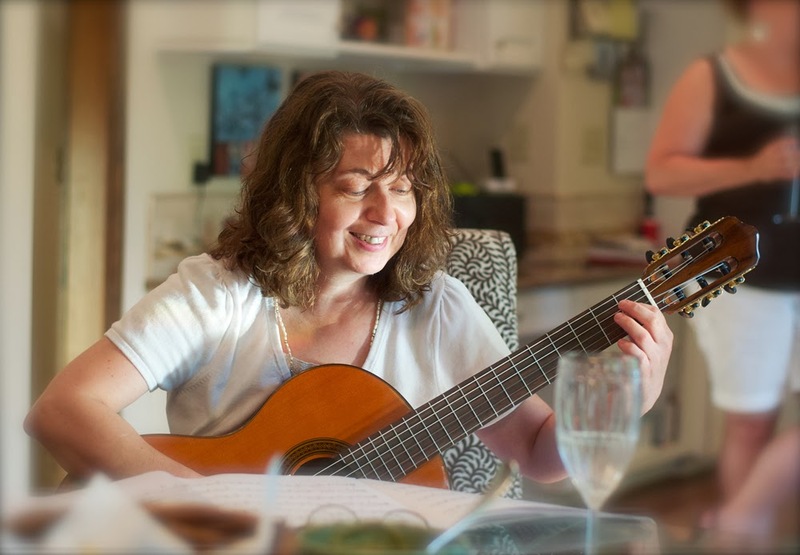 As you may have previously read on our blog, Clare Callahan, Professor of Classical Guitar at the College Conservatory of Music at the University of Cincinnati, recently put on the 30th annual Classical Guitar Workshop. 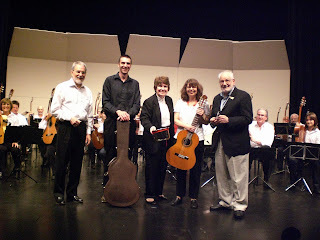 Hill Guitar Company donated a New World Estudio guitar to be awarded to a guitarist at the Saturday night workshops. Clare thanked us and said "Your guitar will be the cherry on top!" The lucky winner of the guitar was Diane Konyk who shared a few words with us about her new guitar. "Thank you for the New World 650c! I was looking for a classical guitar that sounds great, looks beautiful, and also has a thinner neck, better action than my current guitar, and this model fits my needs. The 650c has a full bass sound that carries, and I find the upper notes ring nicely. My wrist also thanks you because with my smaller hands, I needed a different guitar and this fits me very well. I am having fun playing it and will add it to my performances!" We are so happy to hear that Diane's new guitar seems to be a perfect fit!